Absorbency protection: moderate to heavy. Use as a booster supplemental pad to enhance the absorbency of your disposable incontinence briefs, pull up disposable underwear or waterproof pants. Boost the absorbency of your disposable underwear to maximum. 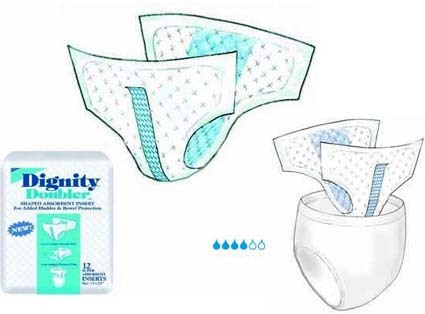 Dignity Doublers do not have a waterproof barrier, rather they are intended to be added on top of other incontinence products that have n existing waterproof barrier. They have an adhesive tape strip that adheres to your other incontinence product keeping the Doubler in place. Supplemental boosters are often used at night inside nighttime disposable, pull up underwear for additional absorbency. Or, during the day to reduce frequency of changing disposable pull up underwear making it a very economical alternative. Dignity Doublers are constructed with superabsorbent polymers for dryness and odor control. The blue acquisition layer helps distribute fluid quickly and evenly away from your skin. Dignity Doublers are 13" by 24" in size. Each bag contains 12 Dignity Doublers. Case quantities of 6 bags or more are available for discounted pricing.